Colleen, daughter of Carol and Tim Grombala of Beverly Hills, will join the John Carroll lacrosse team next year while studying pre-physical therapy. An All-State, All-Midwest, All-Catholic, and Academic All-State attacker, Colleen is a member of National Honor Society, Spanish Honor Society, Marian’s Ambassador Club, LIFE Club, SADD Club, Medical Club, and Pastoral Team. “Marian supported me along the way. 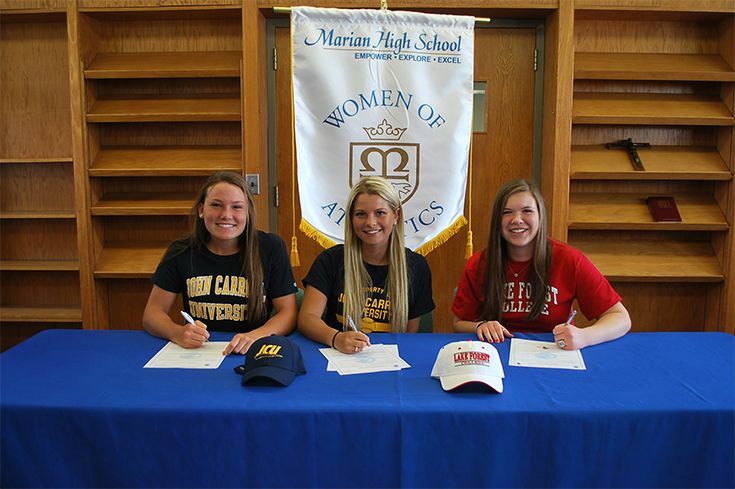 Marian’s athletic program is very strong, and it gave me the opportunity to continue my lacrosse career at the next level,” said Colleen. She also volunteers with Angels’ Place and is the head organizer for the Mind Over Matter Brain Tumor 5K Walk/Run. Lauren, daughter of Kathy and Patrick Ogurek of Beverly Hills, is looking forward to playing softball and double majoring in business and political science next year at John Carroll University. Lauren is a member of National Honor Society, Ambassador Club, and LIFE Club. “I would not be where I am today without the support of all my teachers, friends, and everyone in the Marian community,” said Lauren. She also volunteers at Angels’ Place and the Baldwin Center. Maria, daughter of Mary and Mike Hickey of Troy, will be joining the basketball team at Lake Forest College next fall. Maria is a member of 2014-2015 State Champion basketball team, National Honor Society, Spanish Honor Society, Marian’s Ambassador Club, and varsity track and field. “My coaches and teammates have made me into the player that I am, and I would not be here without them. Marian has taught me hard work, dedication, what it takes to be successful, and how to work as a team,” Maria said. She volunteers with Forgotten Harvest and Gleaners Food Bank. Located in Bloomfield Hills, Marian High School is a Catholic college preparatory school for young women sponsored by the Sisters, Servants of the Immaculate Heart of Mary. The mission of Marian High School is to ensure, within a Christian environment, an excellent education built on a strong academic curriculum, News Release which will enable young women to value human diversity and live responsible lives of leadership and action based on gospel values.